cain.blog – Page 2 – meh. Last Wednesday was Meredith’s birthday, and seeing how I need to test the video upload function on WordPress.com, I thought I’d upload this spectacular video that her sister’s talented family made for her birthday. And before you ask, it’s a real Emmy – you don’t make videos like this one with your iPhone without being legit videographers and editors. Author CainPosted on April 21, 2017 April 21, 2017 Categories Everything ElseLeave a comment on Happy Birthday, Aunt Mere! Auto-generated 3D models of everything. Well almost everything… I’m sure they’re working on that. Author CainPosted on April 21, 2017 April 21, 2017 Categories Everything ElseLeave a comment on Google Earth… wow. And just like that, I went from “I’ll try to post frequently with some intermixed dog pics” to “21 days since your last post on Cain.blog”. I even failed at the dog pics part. How about a dog video instead? If the above wasn’t obvious, we got a drone a little while back, but because of the renovation on the house and the delightfulness that is late winter in Maine, I’ve only taken it out two or three times. Now as the weather changes, I hope to really start exploring the area from a new perspective. To be honest, this was one of the bigger nonessential purchases I’ve made in a long time, and although I don’t really need to justify my spending to the three of you reading this post (sorry Dad), I will. The Mavic Pro is awesome. 4k video, crazy-intelligent flight modes (i.e. active tracking, tripod, and return to home), easy to use controls, and it all folds up, Transformer-style, to be the size of a nalgene bottle. Meredith and I write a travel blog on the side, Map & Menu, and we really want to start incorporating video into the posts. The Mavic Pro gives us a drone that we can pack away in the bottom of a backpack, without the need for extra cases or bags. I can’t emphasize how convenient the size/quality ratio is. The world really is more amazing from a new perspective. We’ve noticed this while traveling past our neighborhood from the water in a kayak or on a boat, but it can much more simple than that – sometimes I reverse the routes of my walks with Orvis just to see life from a new angle. Everything seen from the drone is seen from a new angle. It’s my money, and just another perk of DINK life. If you have any experience with drones, video, or video editing, and have some tips for the free-time black hole I’m about to cruise into, let me know in the comments, or the next time I see you on Slack. I’m crushing the bathroom/laundry room rennovation. If “crushing” means “taking my sweet time to the frustration of my extremely patient wife”. 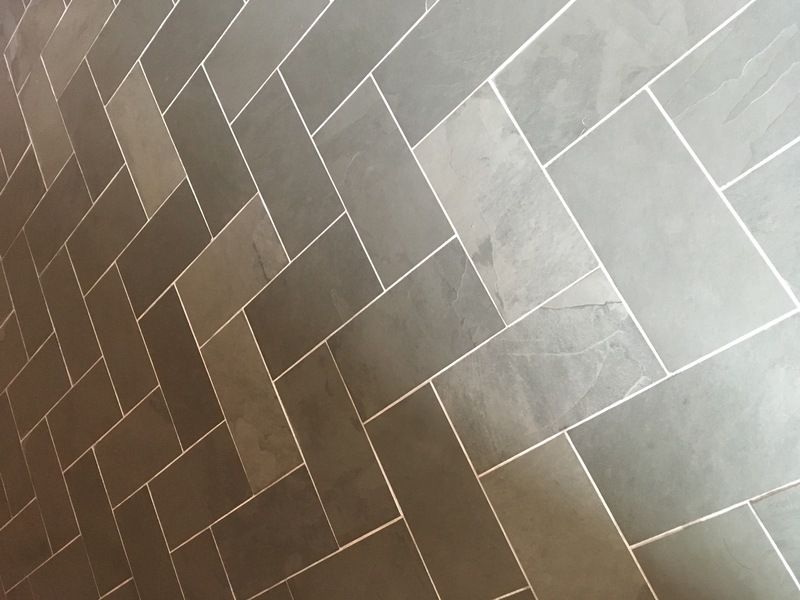 Check this herringbone tile job that I’m particularly proud of. I really do hope to finish it up in the next week and blog about the adventures. h/t Lance for the always horrible pun in this month’s title. Author CainPosted on April 17, 2017 April 21, 2017 Categories Everything Else1 Comment on Droning on and on. Author CainPosted on March 27, 2017 Categories Everything ElseLeave a comment on Survive and advance. I know one pup that’s happy with the 15″+ that got dumped on us this week. Every big snow storm makes me think back to this Instagram that Meredith snapped 4 years ago. It’s crazy to think that at 10 years old, Orvis still loves jumping through the snow like it’s the first time he’s seen it.